In 2021, the feat of navigation that is the Lucy mission will launch. To steer Lucy towards its targets doesn't simply involve programming a map into a spacecraft and giving it gas money – it will fly by six asteroid targets, each in different orbits, over the course of 12 years. Lucy's destination is among Jupiter's Trojan asteroids, clusters of rocky bodies almost as old as the Sun itself, and visiting these asteroids may help unlock the secrets of the early solar system. 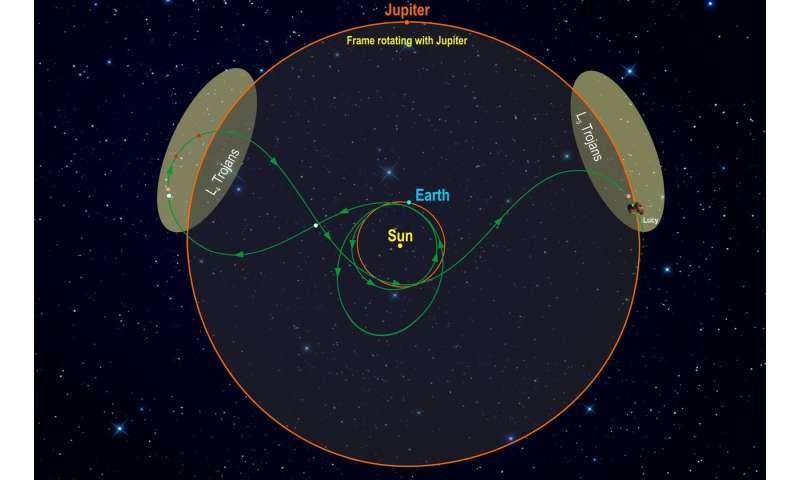 Lucy will encounter a Main Belt asteroid in 2025, where it will conduct a practice run of its instruments before encountering the first four Trojan targets from 2027-2028. In 2033, Lucy will end its mission with a study of a binary system of two Trojans orbiting each other. Scientists and engineers involved with trajectory design have the responsibility of figuring out that route, under Flight Dynamics Team Leader Kevin Berry of NASA's Goddard Space Flight Center in Greenbelt, Maryland. One such engineer is Jacob Englander, the optimization technical lead for the Lucy mission. "There are two ways to navigate a mission like Lucy," he said. "You can either burn an enormous amount of propellant and zig-zag your way around trying to find more targets, or you can look for an opportunity where they just all happen to line up perfectly." To visit these aligned targets, the majority of Lucy's high-speed lane changes will come from gravity assists, with minimal use of fueled tweaks. "OpNav," as optical navigation technical lead Coralie Adam refers to it, is the usage of imagery from the on-board cameras to determine Lucy's position relative to the target. This is a useful measurement used by the navigation team to tweak Lucy's route and ensure it stays on the nominal flyby path. Adam works in Simi Valley, California, with KinetX, the company NASA selected to conduct Lucy's deep space navigation. By using the communications link from the spacecraft to Earth, Adam said, the Lucy team gets information about the spacecraft's location, direction and velocity. The spacecraft takes pictures and sends them down to Earth, where Adam and other optical navigators use software to determine where the picture was taken based on the location of stars and the target. The orbit determination team uses this data along with data from the communications link to solve for where the spacecraft is and where it is expected to be, relative to the Trojans. The team then designs a trajectory correction maneuver to get Lucy on track. "The first maneuver is tiny," said navigation technical lead Dale Stanbridge, who is also of KinetX. "But the second one is at 898 meters per second. That's a characteristic of Lucy: very large delta V maneuvers." Delta V refers to the change in speed during the maneuver. Communicating all of these navigation commands with Lucy is a process all on its own. "Lockheed Martin sends the commands to the spacecraft via the Deep Space Network," Adam said. "What we do is we work with Lockheed and the Southwest Research Institute, where teams are sequencing the instruments and designing how the spacecraft is pointed, to make sure Lucy takes the pictures we want when we want them." "The maneuvers to correct Lucy's trajectory are all going to be really critical because the spacecraft must encounter the Trojan at the intersection of the spacecraft and Trojan orbital planes," Stanbridge said. "Changing the spacecraft orbital plane requires a lot of energy, so the maneuvers need to be executed at the optimal time to reach to next body while minimizing the fuel cost." While Lucy is conducting deep space maneuvers to correct its trajectory toward its targets, communications with the spacecraft are sometimes lost for brief periods. "Blackout periods can be up to 30 minutes for some of our bigger maneuvers," Stanbridge said. "Other times you could lose communications would be when, for example, the Sun, comes between the Earth tracking station and the spacecraft, where the signal would be degraded by passing through the solar plasma." Losing contact isn't disastrous, though. "We have high-fidelity predictions of the spacecraft trajectory which are easily good enough to resume tracking the spacecraft when the event causing a communication loss is over," Stanbridge said. What route will Lucy take once its mission is complete, nearly 15 years from now? "We're just going to leave it out there," Englander said. "We did an analysis to see if it passively hits anything, and looking far into the future, it doesn't." The Lucy team has given the spacecraft a clear path for thousands of years, long after Lucy has rewritten the textbooks on our solar system's history.